Home > Blog > Survey about customers’ satisfaction regarding Meet & Greet Parking. Survey about customers’ satisfaction regarding Meet & Greet Parking. Traveling by air has now become very easy. To meet passengers’ requirements, airports are being equipped with modern techniques. Airport parking is considered most important for the convenience of passengers. Many airport parking companies are working in UK and large numbers of passengers use their services. Commonly travelers use Meet & Greet car parking service during air travel. That is why; parking companies usually offer different packages and deals to attract customers, especially in holiday season. To evaluate the customers’ satisfaction about these discount deals and packages, a survey has been conducted at main airports of UK. One thousand people were surveyed. They have been asked to answer the questions related to the security, quality of services, discount packages & professionalism. Survey result indicates that, generally people are satisfied with airport meet & greet in UK. Some users had shown their concern about security and a few had demanded more cut in prices. The survey shows that 55% travelers were highly satisfied with the security of Meet & Greet, 35% people were satisfied to some extent, whereas only 10% users have expressed their concerns about security and demanded to enhance the security. According to the survey results 62% off users were very happy with the service quality while 20% considered it satisfactory. The other 18% had expressed their reservations regarding service quality. Public opinion regarding discount packages from meet & greet parking was entirely different from aforementioned statistics. Most of the people were not satisfied with discounts and demanded to increase its ratio. Survey results showed that only 30% customers were satisfied with the discount rate in parking deals. Other 50% and 20% were not satisfied and somewhat pleased with the discount ratio, respectively. Customers’ feedback about professionalism was positive. 75% of the clients have showed full satisfaction whereas 20% of the users were somewhat satisfied with professionalism of the companies. 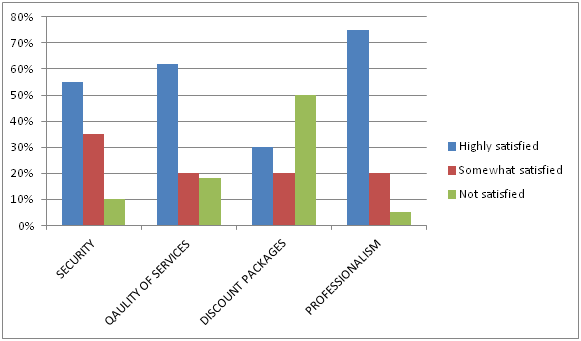 Only 5% customers had made complaints for lacking professionalism. Aforementioned survey result indicates that UK Airport Parking deals are significantly up to the expectations of customers. Previous PostSummer Offer 13 March 2015.Next PostValet Parking Is Safer Than Ever Before.